L3 Technologies has achieved on-time delivery of the first Boeing-built KC-10 aerial refueling aircraft under L3’s contractor logistics support contract with the U.S. Air Force. New York City-based L3 said Thursday its Vertex Aerospace division received the aircraft in January 2017 and performed heavy maintenance check on the KC-10 within six months, in partnership with subcontractor HAECO/TIMCO. Vertex Aerospace won a potential $1.9 billion contract from the Air Force last year to provide logistics support for KC/KDC-10 aircraft. L3 performs contractor operated and maintained base supply, field service representative and depot maintenance services for 59 Air Force KC-10s as well as COMBS and FSR support for the aerial refueling system of two KDC-10 tankers of Netherlands’ air force. 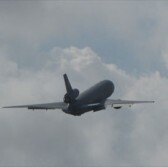 Vertex Aerospace provided logistics support to the KC-10 fleet from 1993 through 1998.